Let me begin with a huge thanks to @RoyanLee who suggested the @InquiringShow Inquiring Minds podcast in his blog last summer. It has been such a great source of learning for me, especially while out walking the dog, doing the dishes, folding laundry or even (yes, Brandon Grasley) while brushing my teeth! The January 2, 2015 Inquiring Minds podcast is all about positive thinking, and how it relates to achieving our goals for 2015. 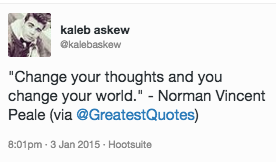 I grew up with a grandmother who was a disciple of Norman Vincent Peale and “The Power of Positive Thinking”. But does “positive thinking” actually lead to a better outcome? Is this quote actually even true? Professor Gabriele Oettingen helps us to rethink our beliefs about positive thinking. She challenges us to think about positive thinking as a number of different activities instead of just one way of being. Sometimes, we think very positively about an upcoming event because we have had similar success in the past. This type of thinking is based on reality, and it often results in better outcomes because it is a motivating factor. However, having positive daydreams about upcoming events is linked to poorer outcomes. Positive daydreaming can lead to relaxation. Professor Oettingen suggests that people who frequently use positive daydreaming as a strategy, convince themselves that they are fine, and they don’t take the necessary steps to move forward in achieving their goals. Image shared under a Creative Commons attribution, non-commercial share-alike license by Angie Torres. “Mental contrasting“, however, is a technique that can lead to successfully achieving some goals, while letting go of goals that you will not be able to achieve. The important factor is building close connections between your current reality and your goal as well as your current reality and identified obstacles, and what is needed to overcome the obstacles. The process is known as “WOOP” – Wish, Outcome, Obstacle, Plan. The process is explained here: http://www.woopmylife.org/. It’s a scientific approach to achieving the outcomes you want in life. Can it turn your wishful thinking into the life you are looking for? In the podcast, Indre Viskontas struggles with this confluence of science and “self-help”. We are all looking for ways to help us achieve the things we want in life, but is this really science? I would love to hear if this little piece of research helps you “stick” with your 2015 resolutions. Could this be a helpful strategy for students? I find that way too many people deal with thinking and planning and scheduling so on. Moreover, analyzing the way they think about some stuff they are planning. It is good for sure to be positive about things we are initiating or trying to achieve and implement. Otherwise: why even bother if one knows from the beginning it’s not going to happen? I believe the missing part is quite often the actual doing. I’ve seen people who were getting ready to start painting. They tried to schedule time, bought supplies, made notes, researched offered classes and even applied for them, but nothing happened. It was just sort of plan. Many real activities require action. I mean, we always need some kind of a rough sketch or plan of the main parts or points, etc. I wish everybody: simply get to what you want to do and start doing it. If it is writing a book, sit down and start writing. If it is building a business, start making the product or service list, price it out, prepare presentation and very soon you’ll see what’s still missing. If it is music or art: create it, learn from your own errors instead of planning them. If it is a house: build it or buy it. Regret nothing. We live in the present moment, future may be a lot different from what we have imagined.